The Tertill is a cute little autonomous robot from Joe Jones, inventor of the Roomba. The wheeled device is weatherproof and solar-powered, meaning that you should just be able to leave it out in your garden without bothering to charge it or take it in when it rains. Using some of those good ol' "proprietary algorithms," it continuously patrols the soil. Capacitive sensors in its front bumper tell it to back off and turn around whenever it encounters tall, mature plants or other obstacles. 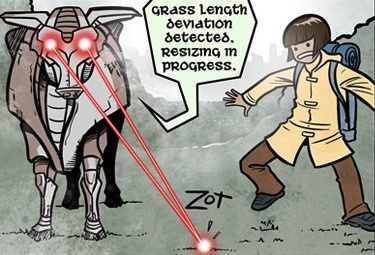 Those sensors will also keep it from leaving the garden, as long as the garden is surrounded by a short fence, wooden borders, or something else for it to encounter. Additional capacitive sensors in its underside detect weed seedlings that are short enough to pass under its bumper. When this happens, it stops and activates its bottom-mounted string trimmer (aka weed-whacker), cutting the seedling down. In order to spare the seedlings of desired plants from that same fate, users place supplied plastic collars around them. Although Tertill was initially announced a few months ago, Jones informs us that a crowdfunding campaign should begin sometime this summer (Northern Hemisphere), with backers receiving their robots by the end of the year. Its estimated retail price is US$300. 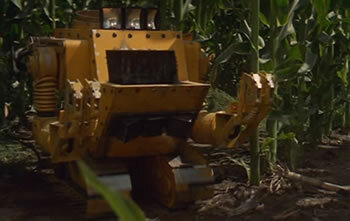 Farm robot enthusiasts enjoyed the agricultural robot pest controller from the film Runaway, which was just one of many robots gone wild. "What's the model? 7799 agricultural?" "Got yourself a runaway, Jack?" "...pest controller. The CPU is an old 8088." "Just the claw. And it's only programmed to look for things smaller than an inch."